Is This How The Illuminati/Luciferians/NWO Plans To Depopulate The United States? As you probably know, there is a global, semi-secret program under way to establish a global governance, a “world government” or a New World Order. Some, Q for one, mentions “NAZI World Order”. The driving force among men towards establishing the NWO is the Order of the Illuminati, or the “illuminated ones”. These folks are Luciferians. They worship Lucifer and consider him “good”, directly opposing the Word of Yahuah, which states that “only Yahuah is good”. One of the axioms of the Illuminati is this: The planned victims of any act of ritual sacrifice must be told in advance of the event. The telling does not have to be point-blank obvious. It can be hidden in plain sight, so that future investigators can discover the warning and that the victims can be considered warned if they are paying attention. But Yahuah knows all, and He warns His people in advance very clearly. His Holy Spirit, that divine essence of Himself that goes wherever it desires, will warn those who have ears to hear. That being the case, I want to warn you now: The Luciferians plan to kill billions of human beings. 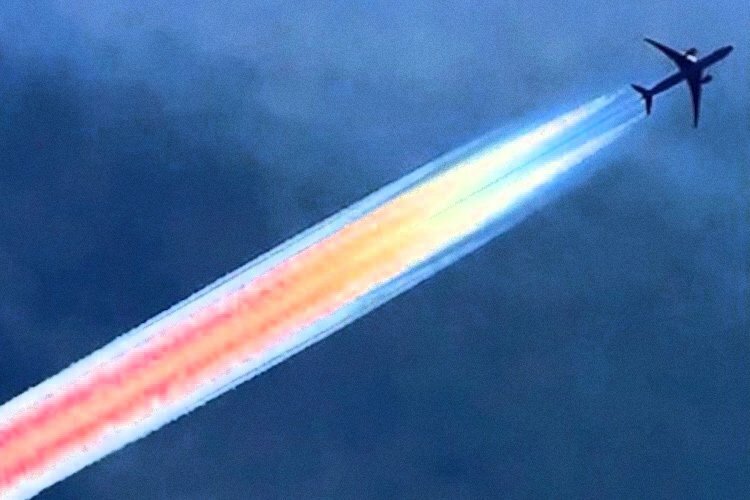 Right now, flying over every NATO nation on earth, are thousands of large jets spraying chemicals and nano-particle metals into the atmosphere. The lie is that the spraying is necessary to “prevent global warming”. The truth is that chem-spray from airplanes is the easiest and most efficient method to get their satanic chemistry into the bloodstreams of one or two billion human beings. First, lets consider the Luciferian requirement to warn first. From a government document hosted by Utah.gov, is this paragraph from research into the Tetrads, the Beast, and “rising out of the sea”. One interesting find related to the god of the Trident is that of the missing Malaysian Airline 370. There have been many who have attributed this event to an orchestrated foul play of the Illuminati kind. It has been made known by many who can decode such an anomaly that the Illuminati is announcing its plans ahead of time through logos related to the Trident. The Trident is the symbol of the King of the Sea, the Abyss, and Poseidon…that of Satan. Even some in government are pursuing the truth. JerryWDavis.com is visited by some individuals in Washington, D.C., and they are looking for the Truth, which is good to see. Illuminati warnings are in movies, too. A terrific example of this is found in the horror movie titled “The Cabin In The Woods“. The “cabin” is a high-tech deep state electronic marvel, used for self-inflicted ritual sacrifice to “the gods below”. The plot of the movie entails the killing of several teen-agers, each one representing a personality or character type that must be killed in specific ways, at specific times. Critical to these sacrifices is that each character must be warned by “hidden in plain sight” clues. Most mega-rituals follow specific rules that are clearly spelled out in the movie. These rules are made to give the rituals more potency while allowing the powers that be to avoid the negative effects of bad karma (according to their weird interpretation of it). 1st Rule: Announcing What Will Happen Beforehand. On their way to the cabin, the teenagers meet an unsavory character dubbed “The Harbinger” that warns them in not-so-subtle ways that they will be killed. Despite the warnings, the friends resolutely carry on. Warnings are required. 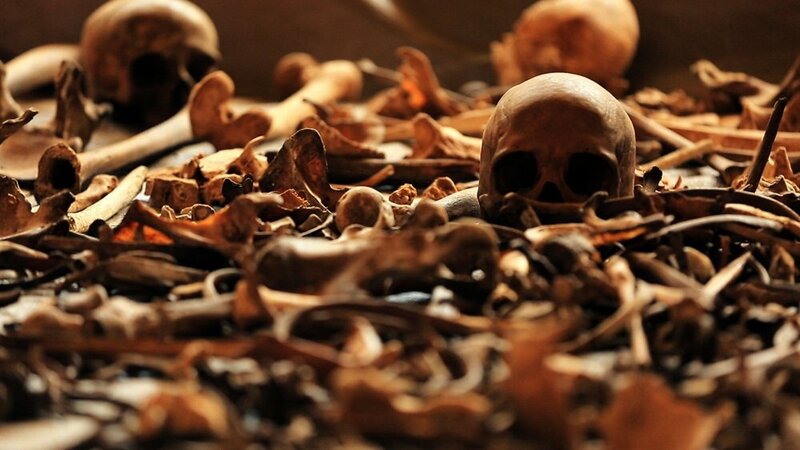 Clues must be presented in plain sight in order for the ritual murders to have positive effect with “the gods beneath the earth” (Remember when Yahusha (Jesus) went beneath the earth to visit the fallen angels, locked in pitch black dungeons?). That said, we must now examine a warning that is given to the entire earth. This warning is in plain sight, and was commissioned by the Masons, a base branch of the Illuminati. All Illuminati are 33rd Degree Masons. 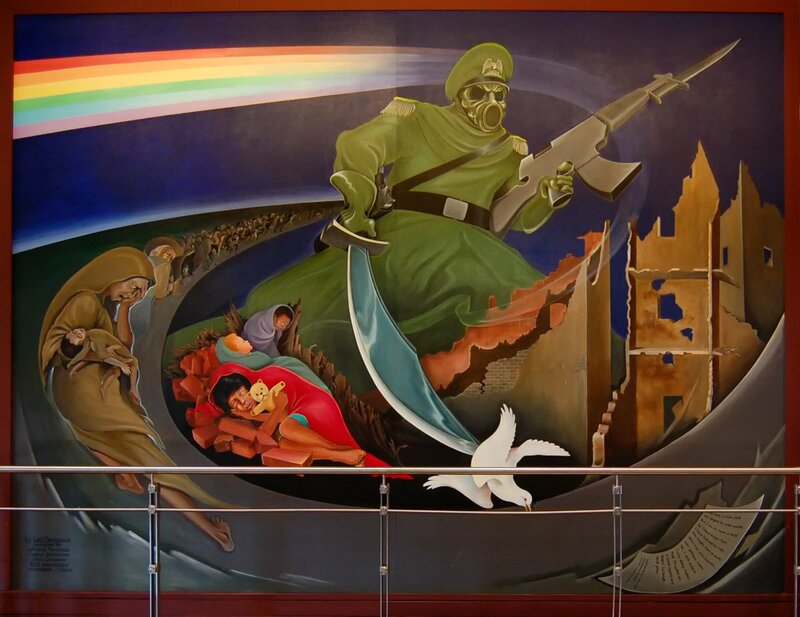 In the Denver International Airport, there is painted a series of murals depecting various scenes: worship of the illuminator, all guns being confiscated and of unique interest, children dying from some colorful gas. Note the gas mask on the soldier, and the Russian-style rifle. Note the endless line of weeping mothers, most of them brown-skinned third-world citizens, and note the blonde-haired child the point of the gas is directed at. Note also the dove of peace is stabbed in the back-side. Symbolic, no doubt. But what does the gas represent? It looks similar to a rainbow, but rainbows are not ordered as these colors are ordered. 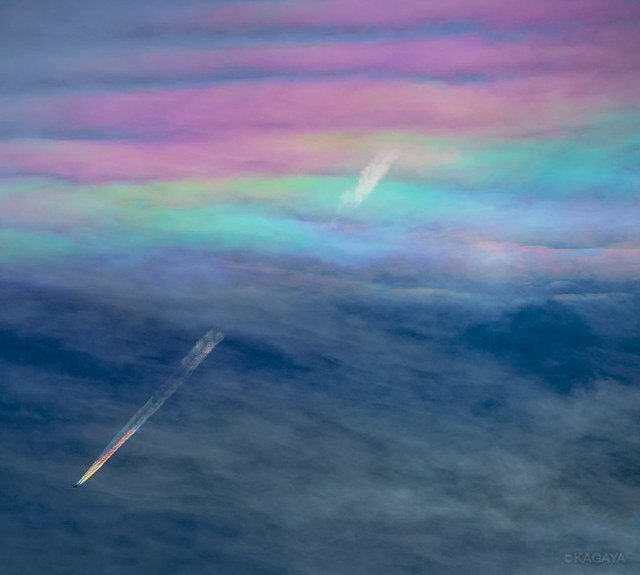 And also observe how straight this colored vapor begins, fading to a wispy and ultra-light fog as it descends closer and closer to the victims. Notice in this chemtrail that it starts our very linear, just like in the mural painting commissioned by the Masons/Illuminati. Tight, brightly colored and linear. I have seen this myself, and even photographed it. The colors are visible due to the angle of the sun. Each color is a different substance, and solar radiation in the visible spectrum is differentiated like a prism, allowing us to see this. This is one warning in plain sight. Depopulation is a key goal of the Globalists/Luciferians/NWO. A website called Deagel.com is quite interesting in that it predicts, by 2025 (seven years from now) a loss of 83 percent of the population of the United States. Around 275,000,000 dead Americans. Deagel is a mystery. No one knows who built the site, and it has been up for years. 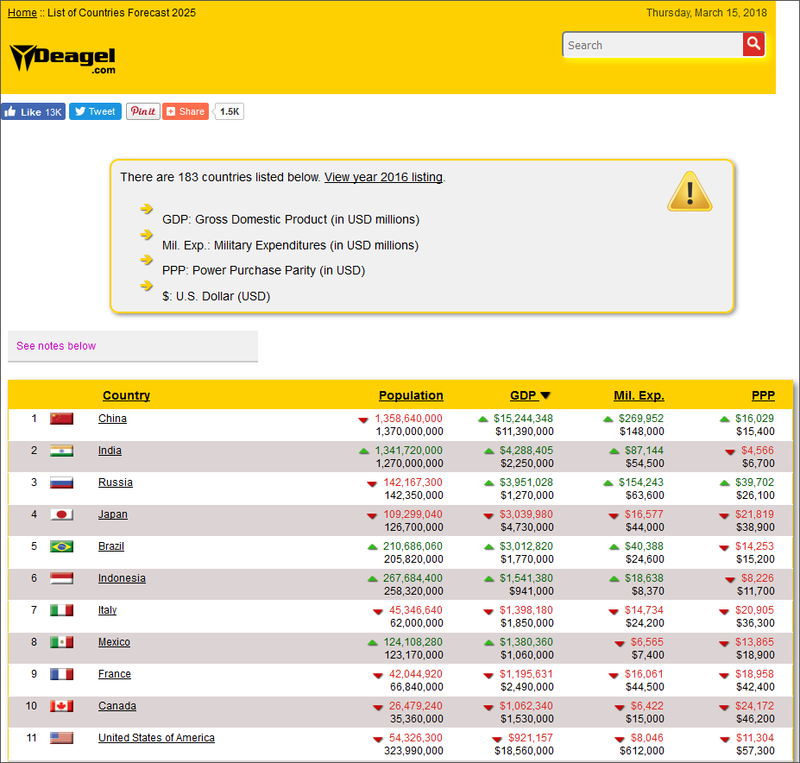 It lists armaments, gross per-capita economic production, missile types per country and more. Deagel is used as a resource by top-level research firms when they need data for their clients, so obviously Deagel has professional credibility. See for yourself. Below is a partial screen shot from Deagel, giving you the numerical population values for the United States. Note the projected loss of human life. Point is this: We live in the end time. The vision I had indicates God-driven destruction and the separation of the righteous from the unrighteous. The servants of ha shatan, or the satan, are busy using every technological means to bring about the NWO, and Americans will not submit to it. Therefore, we have to be disposed of. If you have not accepted Yahusha (Jesus) as your savior, do so. If you consider yourself saved but do not adhere to the commands of Yahuah, start studying His Word today so that you will be counted among the Righteous. 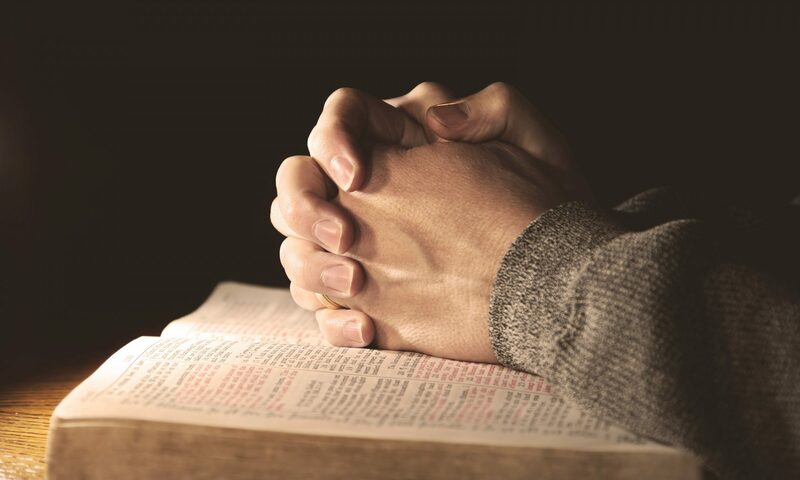 Do not be deceived by the lies within the church. We are called to obedience, and it is for our good and His joy. Check it out. Hidden in plain sight?